This page explains how to configure outbound routing for SMS messaging using the graphical user interface of the Ozeki NG - SMS Gateway software. This guide features step-by-step instructions to enable you to successfully configure outbound routing by editing the outbound routing table. It also includes brief analyses of how the outbound routing table applies to example SMS messages. Outbound routing is used when you want to send a message. If you have more then one service provider connection, you can use the outbound routing table to configure which connection you wish to use to send the message. Here is how it works: The outbound routing table has a column called "User" on the right hand side. In this column you define which user will send the message. This user is the "source" of the message. Next to the "User" column there are three columns: "Sender", "Receiver", "Keyword". These three columns are called "Condition". If the message to be sent matches to the conditions, this route will be used. Next to the conditions on the left, you can find the column "Provider". This column is the "Destination" of the message (Figure 1). This means the message will be sent through this service provider connection. Here is how you should read this table: "If the message is sent by user "sqlexpress" and the condition (Sender phonenumber, Receiver phone number, Message text) matches, this message should be sent using service provider "HttpServer". The construction of routing tables is essential for efficient routing. You can find an instructive example of configuring outbound routing to reduce the costs of SMS messaging on the Least Cost Routing page. The appropriate configuration of outbound routing is essential for the load balancing feature of Ozeki NG - SMS Gateway. To find out more about it, check out the Load Balancing and the Load Balancing for SMPP v3.3 page. The software allows you to configure the routing of both incoming and outgoing messages. To find out how to edit the outbound routing table and how it applies to example SMS messages, read the sections below. To find out how to edit the inbound routing table and how it applies to example SMS messages, check out the Inbound Routing page. Outbound routing describes the routing of outgoing messages. To configure the outbound routing, you need to set outbound routing rules for Ozeki NG - SMS Gateway. To set outbound routing rules, you need to edit the outbound routing table of the program. The outbound routing table is composed of any number of rows of cells. Each row is a routing rule, and each cell contains a directive. The engine processes the routing table step by step, from the first to the last row. It compares the User and the conditions (Sender, Receiver, Keyword) as directives to the properties of a message. It goes through the routing rules from top to bottom, checking if the properties of a message match the directives of a routing rule. If there is a match, the program will send out the message using the service provider connection specified in the rule. Similarly to an incoming message, an outgoing message can be assigned to a destination. The destination, as mentioned above, is one of the service provider connections you have installed and configured. However, the routing of an outgoing message is different from that of an incoming message. When the program has found a rule that is applicable to the message, it will ignore subsequent rules (even if they also match the message). As a result, the software will not use other service provider connections (specified in subsequent rules) to send out the message. The configuration ensures that the message will not be sent out in multiple copies to the same receiver. Click the Edit button in the top right-hand corner of the Outbound routing panel. This panel can be found in the client area (the middle section) of the Management Console. You can also start editing an outbound routing rule by clicking the Outbound routing item in the Edit menu (Figure 1). To delete a rule included in the table, click the Del button beside it (Figure 2). Specify the conditions in the appropriate edit boxes. Enter the sender phone number, the recipient phone number and the keyword. The keyword is the first word of the SMS message. Note that you can only select a service provider connection that has been installed and configured. Click OK when you have finished editing the rule (Figure 3). Then the rule will be included in the outbound routing table. Routing decision: The message is to be sent out by defaultout (Vodafone). Explanation: The message from the 'admin' user will be sent out by Ozeki NG - SMS GATEWAY using Vodafone by defaultout. This is because the message text does not match the keyword specified in the first routing rule (outbound0). The username (admin) does not match the username (http1) specified in the second rule (outbound1) either. The third routing rule (defaultout) does not specify the user, the keyword or any of the conditions (there is ANY in the respective cells). As a result, the message will be sent out using the Vodafone connection. Routing decision: The message is to be sent out by outbound0 (T-Mobile). Explanation: The message from the admin user will be sent out using T-Mobile by outbound0. This is because the user matches the user, and the first word (GAME1) of the message matches the keyword (GAME1) specified in outbound0. The routing will finish, and the message will be sent out. Routing decision: The message is to be sent out by outbound1 (T-Mobile). Explanation: The message from the http1 user will be sent out using T-Mobile by outbound1. The first routing rule is not applicable, as the http1 user does not match the user (admin) specified in the first rule. It does match, however, the user specified in outbound1. This rule has no other specifications (there is ANY in all the other cells). Therefore, it will apply to this message, and the message will be sent out using T-Mobile. Explanation: The message from the sql1 user will be sent out using Vodafone by defaultout. 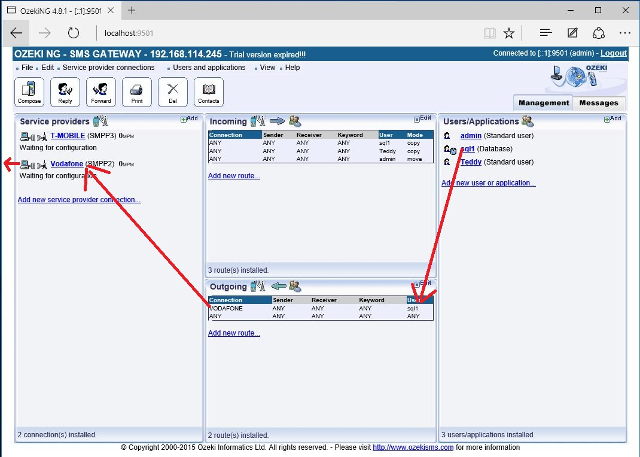 The first routing rule is not applicable, as the username (sql1) does not match the username (admin) specified in the first rule in the outbound routing table in Figure 2. The second routing rule is not applicable, as the username (sql1) does not match the username (http1) specified here either. Consequently, the message is bound to be sent out using Vodafone by defaultout. This is because it is a universal (applicable to any user and any conditions) outbound routing rule in this example.